Resistant synthetic material. It fits easily to the wrist. Graduated in mm and inches. Easy use and measuring. Black in color. Goes up to 10 1/4" & 235MM. Handle in Stainless Steel, points in hardened tempering steel. From outer edge to outer edge at the fork end it is 3 mm wide. The pin tip end is 0.80 mm in diameter. Both the fork and the pin tip end thread into the body of the tool and replacements are available. The total length is 145 mm, which is about 5 3/4 inches. Wide Fork tip 3 mm. 0.80 mm Point Tip for the 6767-S spring bar tool. Swiss Made Stainless Steel 1.00 mm Screwdriver. Bergeon Swiss Made Stainless Steel 1.20 mm Screwdriver. Bergeon Swiss Made Stainless Steel 1.40 mm Screwdriver. Bergeon Swiss Made Stainless Steel 1.60 mm Screwdriver. 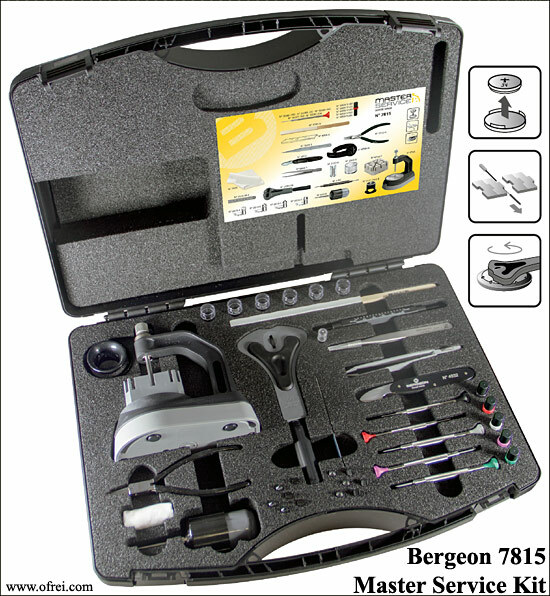 Bergeon Swiss Made Stainless Steel 2.00 mm Screwdriver. Size: 1.00 mm. Tube contains 2 stainless steel blades. Size: 1.20 mm. Tube contains 2 stainless steel blades. Size: 1.40 mm. Tube contains 2 stainless steel blades. Size: 1.60 mm. Tube contains 2 stainless steel blades. Size: 2.00 mm. Tube contains 2 stainless steel blades. � Washable at 40�C � size 230 x 230 mm (9 x 9 inches). Stainless, Antiacid, Antimagnetic. Swiss Made. 120 mm. Tweezers used for battery changes. Has a steel lip at the base for opening battery hatches. Flat nose pliers provide large, smooth non-marring gripping surface and slim profile for ease of access. This is the Bergeon Officers case knife, which is much thicker than the old standard Swiss Army Watch Case Opener. Comes with a tweezers and oil pick. This is the smaller version of the 2819-08 Jaxa case opener. Comes with 2 square bits 2819-B for slotted case backs. Will open diameters from 18 mm to 62 mm. 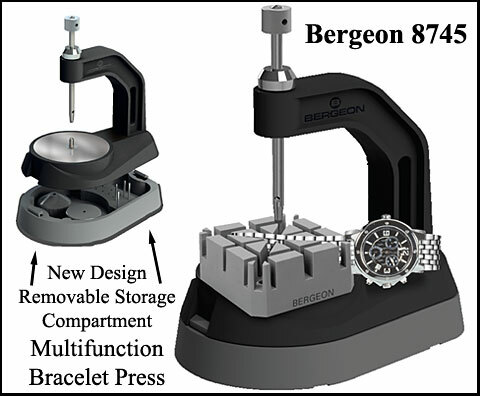 Bergeon has re-designed the traditional bracelet press with the limited space that watchmakers have on their bench in mind. By using composite material for the body and adding a removable compartment for accessories at the base, this creates a light weight and space saving tool. The 8745 multifunction bracelet press can punch out and install pins, unscrew and screw on bracelet screws on watch bracelets. Supplied with one slotted base number 6744-P, one pin holder with drum number 6745-PG-A, two bases with adjustable height number 8745-SRC and 6745-SR-28, one set of 6 blades number 6745-M (sizes: 2x .80, 2x 1.00, 2x 1.20) and 2 Phillips number 6745-MC (size: 1.50 and 2.00 mm), and one set of 6 pins number 6745-G (sizes: .40, .60, .80, 1.00, 1.50 & 2.0 mm). The slotted base number 6744-P allows to maintain in a good position watches with leather or metal bracelet. Both bases number 8745-SRC and 6745-SR28 allow the height adjustment. This Bergeon fixed blade knife is a must for those who want the best. Equipped with bakelite handle. Length: 115 mm. Swiss Made. 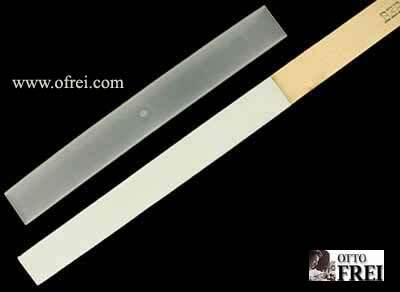 Fine white leather Buff stick 12 mm wide. Shown with a Plastic Buff Protector, which is sold separately. Keep your buff clean, when not in use. I think this tool is a waste of time and money. Sure this was state of the art 50 years ago; still some people have yet to be enlightened so we still sell this Swiss made tool. You will not see me wasting my time trying to use this tool, but that shouldn't stop you from trying it, I just might be wrong. It's just that I've been replacing straps for 30 years now. Swiss made for the (FB-500) BERG-3153 Black Body Spring Bars Tools. This is one single plastic slotted base only of the FB-512. 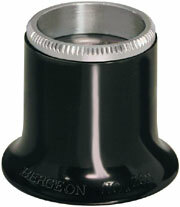 Bergeon part number 6744-P. Slot sizes: 2.2 mm, 2.6 mm, 3.0 mm, 3.4 mm, 3.8 mm, and 4.0 mm. 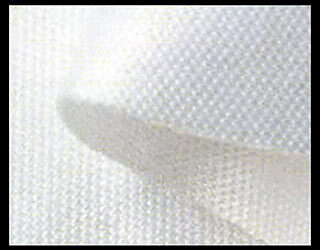 Synthetic material. 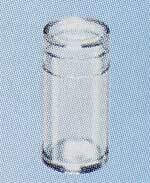 Dimensions: 53 x 53 x 26 mm. Spaces to eject pins. To be used with press No 6745-100, No 6745 and tooling No 6744. Measures 35 mm in diameter; does not roll on the bench. Some say this is the best, again blowers are a personal thing. New Jaxa key is specifically designed to open case backs of large watches. 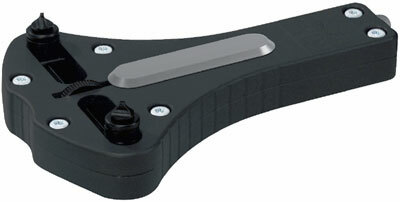 The ergonomic shape provide a firm and comfortable grip. 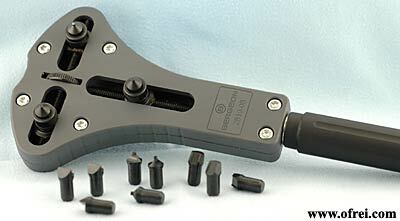 Swiss-made, the new Jaxa wrench is the latest first-rate Bergeon product and is a great tool. It sits on a foam like sponge base inside a plastic display box. Equipped with four different chucks: 3 for polygonal cases, 3 for slotted cases, 3 for cases with holes, and 3 for cases grooved. Will open diameters from 18 mm to 62 mm. For Polygonal cases. Sold in 3 pieces. For cases with slots. Sold in 3 pieces. For cases with holes. Sold in 3 pieces. For oyster cases. Sold in 3 pieces. Full size Jaxa case wrench (Bergeon 2819-08), 4 sets of 3 bits for the Jaxa case wrench (Bergeon 2819-A, 2819-B, 2819-C, 2819-D), multifunction bracelet press (Bergeon 8745), bracelet holder block (Bergeon 6744-P), 4x loupe (Bergeon 2611-TN-2.5), plastic tweezers with steel lip (Bergeon 6460-P), anti-magnetic, stainless steel tweezers (Bergeon 7026-1), 5 stainless steel screwdrivers 1.00 mm, 1.20 mm, 1.40 mm, 1.60 mm and 2.00 mm (Bergeon 30081-100, 30081-120, 30081-140, 30081-160, 30081-200), 5 tubes with 2 spare screwdriver blades (Bergeon 6899-T �1.00 mm, 1.20 mm, 1.40 mm, 1.60 mm and 2.00 mm), snap back case knife (Bergeon 4932), flat nose pliers (Bergeon 2510-N), microfiber cloth (Bergeon 7039), flexible measuring band for wrists (Bergeon 6789-N), spring bar tool (Bergeon 3135), spare pin & fork ends for 3135 spring bar tool (Bergeon 3153-R), leather buff stick with buff protector (Bergeon 1282A & 4056-6), steel ruler (Bergeon 2819-08-R), 6 plastic boxes �15 x 30mm (Bergeon 2963-B), and dust blower (Bergeon 30540) Click here to order the tools individually. For stock checks on watch parts not listed on the site please call the watch material department at 510-832-0355 ext 2., Monday to Friday 9 AM to 5 PM Pacific Standard Time Zone.